Global Fields are related to Custom Fields, but do not require manual creation and set up. Global Fields are automatically created and updated by Sensor Tower - all you need to do is turn on their display. Green borders indicate a Global Field. Global Fields are turned off by default for all users, but once turned on by you, or by your account administrator, they can be seen and used in the Store Intelligence, Ad Intelligence, and Usage Intelligence, similar to built-in Filters like Device, Country, and Category. Organization Visibility: (admins only) Your organization's administrator will see an extra column on the far left called "Organization Visibility". 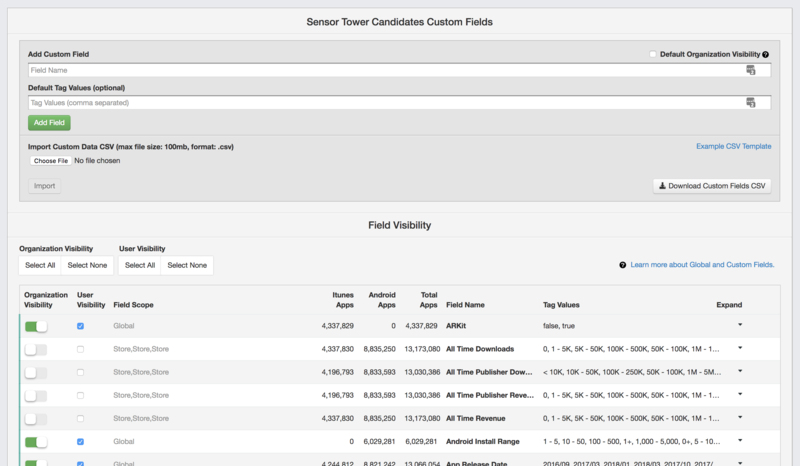 This column is used to control default visibility of all Fields for all users in the organization (more details on this feature below). User Visibility: Sets your individual user preference for visibility of the both custom and global fields. Scope: Indicates whether a particular field is Global or Custom. Field Name: Indicates the name of the Global or Custom field as it will be display in the Top and Trending Module of Store Intelligence. Please note that the pages within the platform will only display 7 Fields by default, regardless of your visibility settings in this module. *Read below for more information on how to expand display from within Store Intelligence to more than 5 fields. Additionally, if a Custom Field doesn't have any apps in it, that Field will NOT be displayed in the Top and Trending Module, even if you marked it as Visible in Manage Account section. When an organization administrator turns a field's Organization Visibility setting to on for a particular Field, that action will also turn the My Visibility setting to on for every user account that is currently registered as part of their organization. Thereafter, individual users can select their personal preference for visibility via the My Visibility column shown above. The reverse action, of an admin turning the company Organization Visibility to off, does not affect the My Visibility settings for existing users (it will affect new users). For convenience, there are also Select All and Select None toggles at the bottom of the custom tags screen for Admins and Users. 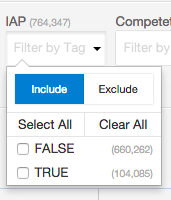 The numeric count you see to the right of each Field (Custom or Global) represents the total number of apps that fit this specific criteria. 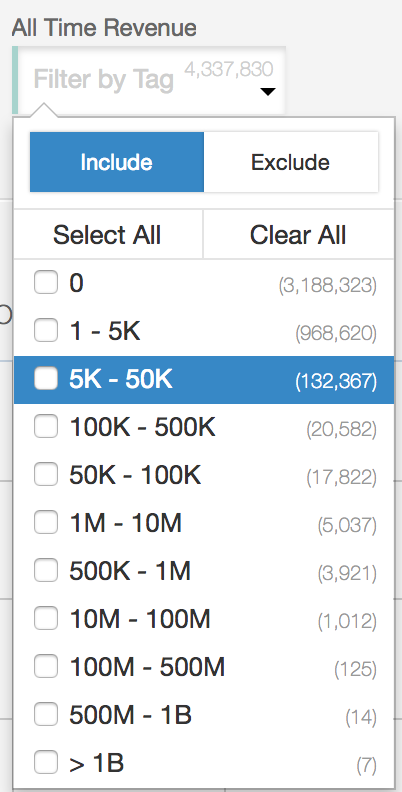 Next to each option within these fields is the number of apps within each selection criteria. Please note that not all apps will fit the rank criteria well enough to be displayed in the chart within our different platforms. 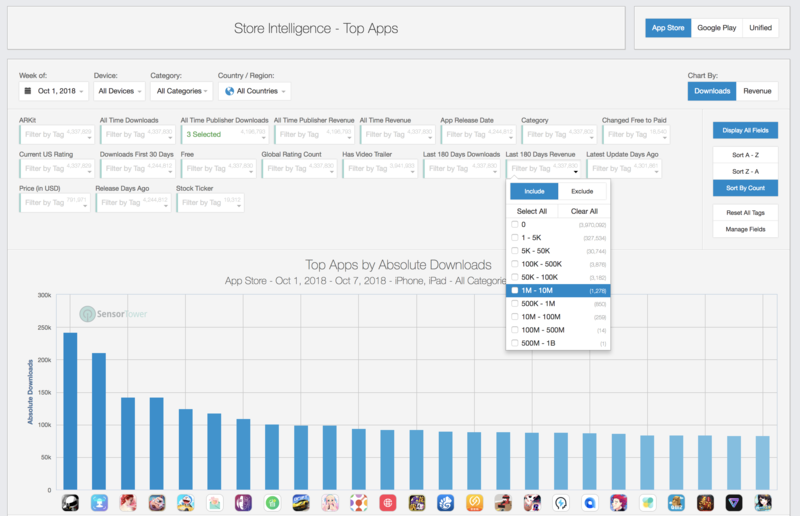 For instance, within Top Apps in Store Intelligence, only apps that meet the criteria within the top 10,000 apps will be shown. 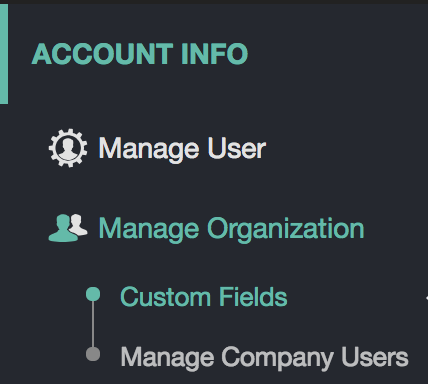 This menu will display all Fields for which you have enabled visibility in the Account Management page, as described above. Please note that if you do not have visibility enabled for any Fields, the Display All Fields button shown above will have no effect. All Global Fields have sorting supported. 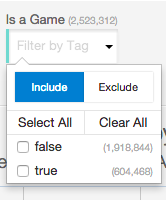 Each Field dropdown list can be sorted to help with selection of items. All Global Fields are updated daily. Recent App Update : formatted YYYY/MM. If no recent updates, uses initial release date. Results are based on top countries. European Union has priority over Europe region. True: the release of a new product or service to a restricted audience or market in advance of a full launch. We recognize a soft launch when an app "launches"in specific markets including Canada, Mexico, New Zealand, and Australia, and only gets downloads from these countries. Ratings and rating counts : Android ratings and rating counts are overall or global. If you have any questions, please do not hesitate to reach out to support@sensortower.com.